When the new iPhone was announced, Apple CEO Steve Jobs crowed about a new antenna design that would improve wireless reception by making the metal band forming the outside edges of the phone part of the antenna. Wireless antennas are typically built on the inside of phones. The iPhone 4 uses the band of metal at its edge as part of its wireless antenna. To find out if this innovation really makes the iPhone 4 connect better and faster than previous models, I took the new phone and its predecessor, the iPhone 3GS, for a mini-tour around San Francisco, measuring and comparing the network connection speeds and voice-call quality of the two phones. I tested the phones at the same locations at the same times over the same AT&T network; the only difference was the 3G radios and the antennas in the devices. Though my tests were informal and my results were far from definitive, the results left me with the impression that the iPhone 4's antenna design has some very positive effects on the phone's network performance. And one really negative one. The iPhone 4’s best download speed of the day was 4 mbps--well within the range of speeds promised by next-generation 4G networks, and enough speed for lightning-fast Web browsing and high-quality video streaming. The iPhone 3GS had a top speed of 2690 kbps (roughly 2.7 mbps). 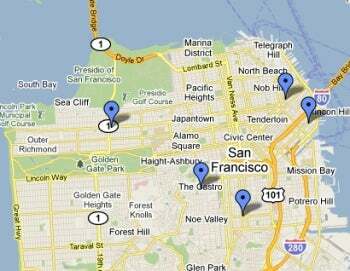 Our San Francisco testing locations (from left to right): Richmond District, Castro District, Mission District, Financial District, and South of Market area. The new antenna may have had an even greater positive effect on upload speeds. The iPhone 4 registered an average upload speed of 434 kbps, fast enough to support basic file sharing but not swift enough to make fat-pipe apps such as multiplayer gaming or videoconferencing run well. 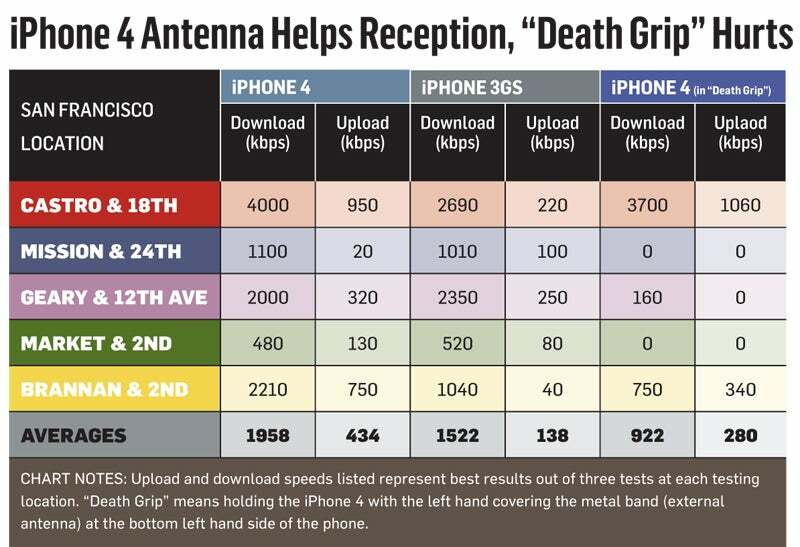 Meanwhile, the iPhone 3GS showed average upload speeds of just 138 kbps across five testing locations. However, the iPhone 4 seemed to have a lot of trouble establishing a fast connection at my testing location in the center of San Francisco's Financial District, and the new antenna didn’t seem to help. After several connection attempts from the sidewalk on Market Street--amid lines of tall buildings on both sides--the best download speed the iPhone 4 could muster was 480 kbps. The iPhone 3GS, meanwhile, managed a download speed of 520 kbps. Bad-sounding and dropped voice calls from the iPhone on the AT&T 3G network have long been the bane of iPhone users here in San Francisco. But in this respect, too, the iPhone 4's new antenna seemed to improve the experience considerably. I was surprised to find that in all the test calls I made with iPhone 4, not one call dropped, and on none of the calls did I hear any noticeable jitter, delay, or static. I was left with the impression that the iPhone 4's 3G radio and redesigned antenna were combining to create a stronger handshake between the phone and the network. AT&T's upgrade to the faster HSPA 7.2 technology in its cell sites probably helped, too. Still, on one call placed from the Market Street location (the one with the tall buildings all around), my voice sounded to the other party as if I were talking from a faraway place, or from the bottom of a deep well. But after hanging up and redialing, I was able to achieve a reasonably clear connection from that location, as well. By contrast, some of the calls I placed (from the same locations) with the iPhone 3GS seemed to be impeded by a less solid connection with the network. Though I could hear the voice of my friend on the other end of the line clearly enough, he noted that my voice sounded “garbled” and “thin” at times. In general, calls placed on the iPhone 4 sounded better than those placed from the iPhone 3GS. The sound of the voices on iPhone 4 calls seemed to cover a wider frequency range than the sound on the iPhone 3GS. Voices (my own and that of the person talking to me) sounded more human and lifelike, and less like the thin, tinny sound of a radio voice. This suggests that Apple has upgraded the quality of both the ear speaker and the microphones in the new device. But this high-fidelity voice quality would not be possible if the 3G radio in the phone were not maintaining a strong connection to the network. Even before the iPhone 4 was released, engineers were speculating that Apple's new exposed antenna design might be subject to interference by the hand holding the phone. Scores of new iPhone 4 owners noticed on launch day that covering the bottom-left edge of the phone with one’s palm can seriously hurt the phone's network performance. Our tests showed that holding one's palm against the lower-left side of the iPhone 4 can seriously degrade connection speeds. My tests today seemed to confirm the problem. At each of my five testing locations, I did an extra set of speed tests while holding the iPhone 4 with my left hand, covering up the bottom-left edge of the phone. At one testing location, this seemed to make no difference: I got the same connection speeds when I held the phone in my left hand and when I tested with the handset sitting on a tabletop. But in the remaining four locations, I saw dramatic speed decreases. In three of my testing locations, connection speeds dropped to zero or near zero when I held the phone against my left palm. The number of connection bars showing dropped from five out of five to just one or two out of five. I also noticed that the latency numbers--the time it takes the speed test to send data up to a network server and back--shot upward into thousands of milliseconds. In the remaining location, download speed fell to a third of that measured when I had the phone lying on the table with the antenna untouched, and the upload speed decreased by half. Smartphone antennas are carefully tuned to receive certain cellular radio frequencies well, while remaining resistant to interference from signals in other frequency ranges. By covering “both sides of the black strip” on the phone, users may be creating a circuit between the two pieces of metal on either side, thus interfering with the antenna’s ability to lock on to the right frequencies, in this case those used in AT&T’s 3G network. Apple, and some in the media, downplayed the flaw Thursday. If the problem were being caused by users holding the phone in their mouths while standing on their heads, I might agree that it’s being overstated. But that’s not the case: Many iPhone 4 users will prefer holding the device in their left hand while hunting and pecking with their right hand on the touchscreen. And there’s a good possibility that that special spot--the iPhone 4's cellular Achilles' heel--will be covered by their hand when they do. I used the FCC-endorsed Ookla testing app on both the iPhone 4 and the iPhone 3GS to measure upload speeds and download speeds. The Ookla test sends a stream of packets from the phone to a network server and back, and then measures the average speeds at which the packets make the round trip. I ran three consecutive speed tests on each phone at each location, and then picked the best upload and download speeds of the three. My voice-call tests were more subjective; I placed calls to a common local number, listening for static, jitter, delay, dropped calls, or a failure to connect. My tests are not meant to be scientific or definitive. They simply show the relative connection performance of the iPhone 4 versus its predecessor in common network conditions on a given day. Testing wireless networks is very hit-or-miss in the first place: Performance depends on a lot of factors, including nearby buildings and other obstructions, the weather, and the number of other users on the network at the time of the test.